A couple of years after moving, Ben and Elizabeth’s marriage is crumbling, in part because they are still childless. They have reached a stand-off where communication in their marriage is mostly arguing and more about what isn’t said. So when Elizabeth awakens one morning to the smell of smoke and discovers a fire raging in the mountains near her home, it’s not surprising she is unable to resist the pull of the fire. Knowing Ben will disapprove, she secretly volunteers to help investigate the fire’s cause. The fire started on the property of John Phillips, an elderly man whose house is the first to be lost to the flames. The police immediately name John a suspect, but Elizabeth isn’t buying it. Why would John purposely start a fire that caused him to lose everything, leaving him homeless? Could the teens he swears have been hanging around his property and harassing him have something to do with the disaster? Is someone on the police force or in the community trying to conceal a crime? Tension builds as it becomes apparent one of those teens harassing John is Angus, the son of Elizabeth’s former friend, Mindy. Their friendship imploded a year ago after a hurtful argument. Smoke is told over the course of six days as the uncontained wildfire metaphorically mirrors the smoldering relationships and seething destruction of everything that is precious to Elizabeth, Mindy, and their families and neighbors. The story is told primarily from two points of view, Elizabeth’s is told in first person and Mindy’s in third. Later in the story, a short passage is told from John’s point of view. In less capable hands point of view fluctuations and the introduction of a new point of view late in the story, might be jarring. In Smoke, the transitions are seamless and keep the story moving forward. 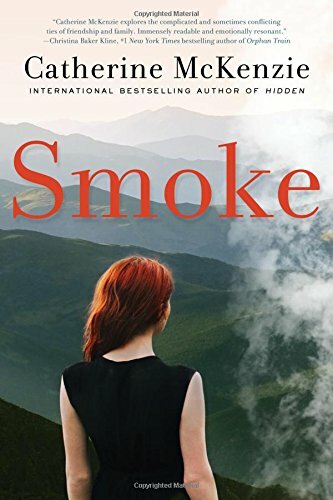 In Smoke, Catherine McKenzie nimbly delivers believably flawed characters, a plot layered with broken trust, suspense, secrets, and spot-on pacing. Smoke beautifully meshes mystery, complex relationships and a love story that will keep readers turning pages and generate thought-provoking book club discussions.